Who will get their hands on the trophy this year? Following a spectacular start to his reign in charge – which included a Six Nations title, a test series win in Argentina and an unbeaten Autumn test series – Joe Schmidt’s side go into this year’s competition as favourites to regain their crown. However with three challenging away games and some injuries in key positions, this year’s tournament may be not as easy for the Irish as some expect. Despite having the advantage of home games against the French and English, the key game for Paul O’Connell’s men will no doubt be the trip to Cardiff on the penultimate weekend of the championship. Despite having a favourable record in Cardiff over the last few years, Warren Gatland’s side will be determined to avenge their 26-3 Dublin drubbing of last year. With both Cian Healy and Jonny Sexton missing at the start of the championship, their replacements will have to step up and perform to ensure that the Lions duo return to a winning team. Despite this a side containing players of the quality of O’Connell, Tommy Bowe and the returning Sean O’Brien should be in contention come the final stages of this year’s tournament. Sam Warburton and his teammates will be looking for more consistency this year, following a mixed campaign last year which saw some top performances at home (France and Scotland) but chastening defeats away (Ireland and England). However, the 2013 champions come in off the back of a promising autumn series which delivered some encouraging performances (Australia and New Zealand) but more importantly finally yielded that elusive southern hemisphere scalp with victory over South Africa. With a fully fit squad at his mercy, coach Warren Gatland is spoilt for choice with in-form players such as Scott and Liam Williams pushing the likes of Jamie Roberts and Leigh Halfpenny for their starting jerseys. 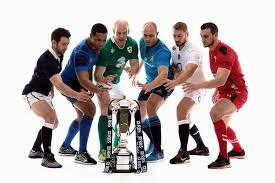 With home games against England and Ireland, confidence is high amongst the fans that another title may be on its way. However with three challenging away games, including a trip to Paris and a daunting trip to face a resurgent Scotland, Wales will need to improve their away form if they are to have any chance of landing the title. In possibly the biggest year in English Rugby history, the Red Rose enter this year’s competition hoping to build some vital momentum to take into a Home World Cup. Having been frustratingly pipped to the post for three years running Stuart Lancaster will be desperate to finally get his hands on that Six Nations trophy. However, despite a fixture list including three home games, Lancaster’s squad has been decimated with injuries in key positions. With the likes of Owen Farrell, Manu Tuilagi, Courteney Lawes and many more on the sidelines much will depend on whether inexperienced players such as Dave Attwood, George Ford and Jonathan Joseph can step up to the plate. Despite these injuries England still have a solid platform from the pack to work with, and with attacking talent such as Jonny May and Mike Brown, you would be a fool to write them off. It has been a tumultuous few years for the French National side. With some abysmal performances under coach Phillipe Saint-Andre to go with a domestic league seemingly full up with overseas players, the biggest challenge for Saint-Andre seems to be selecting players who are playing regularly at club level. The issue has become so big that the French have turned to overseas players such as Scott Spedding and Rory Kockett – both qualifying through residency – to plug the gap. With three difficult-looking away games, France will have to do it the hard way if they are to be successful this year, but with exciting attacking talent such as Wesley Fofana and newcomers Camille Lopez and Teddy Thomas, along with a strong pack, France may be able to spring a surprise or two. Under Vern Cotter, Scotland have begun to find a rhythm to their play which has been lacking in the past. Over the years, Scotland have been renowned for having a strong pack which can compete with any of the other European nations. However, too often their forwards have been let down by a disjointed and disorganised back-line which has failed to spark into life despite containing genuine attacking talent in the likes of Tommy Seymour, Stuart Hogg and Sean Maitland. Under Cotter in the autumn, Scotland found that spark with encouraging try-scoring performances against Argentina and Tonga, along with pushing the All Blacks all the way in a close-fought test match eventually edged 24-16 by the World Champions. Despite this the signs were increasingly optimistic and with young talent such as Jonny Gray and Finn Russell breaking through alongside experienced campaigners such as Greig Laidlaw, Richie Gray and Hogg, Scotland fans believe they finally have a squad capable of competing in every match. Following a disastrous campaign last year with five defeats from five games, Jacques Brunel is under increasing pressure to build confidence amongst his squad with a World Cup looming. With three home games, the Azzurri will be looking to replicate the form of 2013 where they took the notable scalps of the French and Irish in Rome. A pack containing quality experience in the likes of Castrogiovanni, Zanni and the world-class captain Sergio Parisse are able to match the forward packs of many other world nations. However, the Italians have often been lacking in that type of quality amongst the backs and it is up to players like Michele Campagnaro and Luke McClean to prove that the home results of 2013 were no fluke. ← Is Anscombe the answer?